User Role Editor WordPress plugin allows you to change standard WordPress user roles capabilities with easiness of a few mouse clicks. Just turn on check boxes of capabilities you wish to add to the selected role and click “Update” button to save your changes. That’s done. Add and tune your own custom roles which you can assign to the users then. You can create new role as a copy of existing one. Delete self-made roles. Change defaul user role. Why it could be necessary? Let’s suppose you wish that your multi-authored blog contributors upload their own graphics to use in their posts. 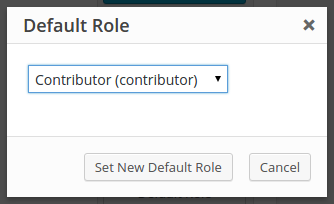 WordPress “contributor” role has no such capability by default. In such situation you have needed to change user role capabilities manually using SQL client as I described at “How to change wordpress user role capabilities” post, if you have enough knowledge in that field. But what to do if you have not? Select a role you wish to change from the drop down list at the top. Page will be refreshed automatically and show you the capabilities list for the selected role. Make your corrections, check/uncheck correspondent check boxes and click “Update” button to save your changes. If you wish to apply this change for all sites of your multi-site WordPress network, turn on “Apply to All Sites” check box at the top of the form before press “Update”. If you prefer to see capabilities names in form e.g. ‘Edit pages’ instead of WordPress ‘edit_pages’ standard form turn on the “Show capabilities in human readable form” checkbox at the right top corner of the main form. Move mouse over capability name and you will see its alternative form name. According to WordPress Codex User Levels were introduced in WordPress 1.5, they were replaced by Roles and Capabilities in WordPress 2.0, and were finaly deprecated in WordPress 3.0. Thus you can hide them in order they do not mess you in your work with roles. Keep “Show deprecated capabilities” check box at the to right corner of the form unchecked for that. If for any reason you need to see user levels, turn on that check box. If you don’t wish to save changes you can click “Cancel” button. If you are needed to restore roles capabilities you have before your or installed plugins made 1st modification to them, use “Reset” button. “User Role Editor” will restore roles and capabilities to its clean state. You will get roles stuff just after WordPress installation. Be very careful with this operation as you will definitely lose any changes you or your plugins made to user roles from the time of fresh WordPress installation. Consider to make backup copy of your database before proceed with “Reset” operation. In order to add/remove your custom role, change default role for new user, add/remove custom user correspondent buttons from the right toolbox panel. If you need your own custom role, create it with “Add Role” button. 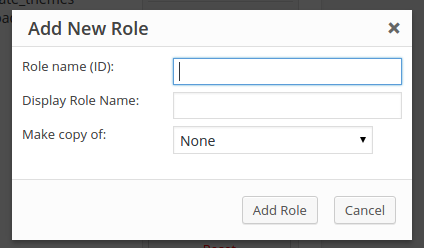 Input new role name into input text field at “Add New Role” box, select existing role from drop-down list if you wish to use its capabilities as starting point for further work and click “Add” button. Remember that you can use latin letters, digits and an “_” underscore sign in your role names. Subscriber role is copied by default if you don’t select such role yourself. Unnecessary self-made role can be deleted with “Delete Role” button. Select role and click “Delete” button for it. Only custom roles appear in the list of roles available for deletion. If some role is assigned to the user or selected as default role for new users it will not appear in this list. Option “Delete all unused roles” is available. Select the role which you wish to use as default for any new created user from the list opening “Default Role” box by click at the “Default Role” button. 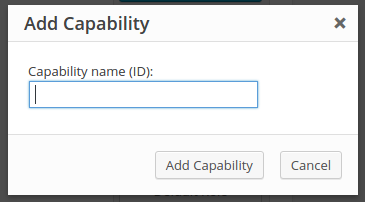 Use “Add Capability” button in order to add new user capability. Remember you can use only latin alphabet letters, digits and underscore sign in the capability name. If you need delete custom capability added by you or some of your old plugins, which you don’t use anymore use “Delete Capability” button. 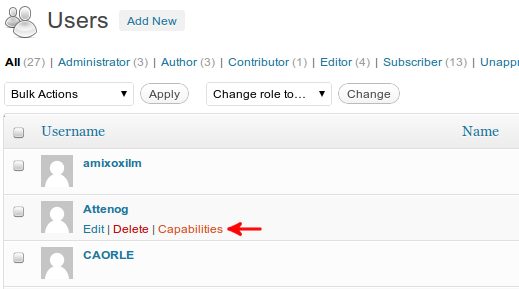 “User Role Editor” doesn’t allow to delete built-in WordPress capabilities and capabilities which are used by any role. You can not turn off capabilities included to the role assigned to this user. You can add/remove other capabilities. They will be applied directly to the user as you click the “Update” button. If you wish to built a fully custom capabilities set for this user, without limitation of any role, select “No role for this site” from drop-down list at the top and make it. User Role Editor has its own options page under the WordPress Settings menu (under Network Admin is plugin was network activated). Do you need more functionality with premium support in real time? Do you wish remove advertisements from User Role Editor pages? Block selected admin menu items for role. “Export/Import” module. You can export user roles to the local file and import them then to any WordPress site or other sites of the multi-site WordPress network. Roles and Users permissions management via Network Admin for multisite configuration. One click Synchronization to the whole network. Per posts/pages users access management to post/page editing functionality. Per plugin users access management for plugins activate/deactivate operations. Per form users access management for Gravity Forms plugin. 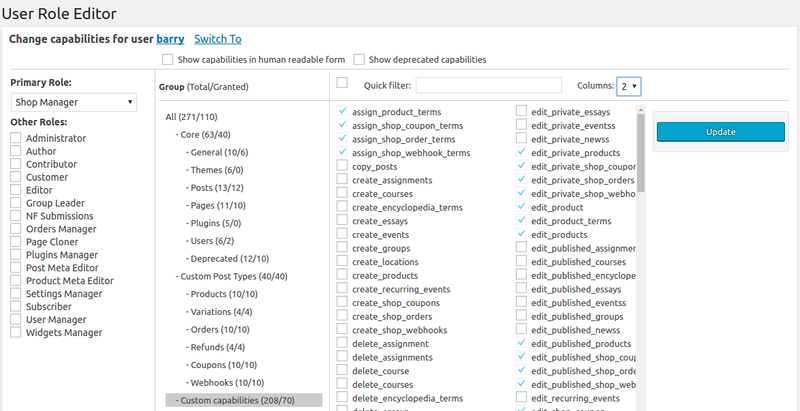 Shortcode to show enclosed content to the users with selected roles only. Posts and pages view restrictions for selected roles. Pro version is advertisement free. Premium support is provided by plugin author Vladimir Garagulya. You will get an answer on your question not once a week, but in 24 hours or quicker. Lorenzo Nicoletti – for the code enhancement suggestion CUSTOM_USER_META_TABLE constant is used now for more compatibility with core WordPress API. Marcin – For the code enhancement. This contribution allows to not lose new custom capability if it is added to other than ‘Administrator’ role. FullThrottle – for the code to hide administrator role at admin backend. You are welcome! Help me with bugs catching, share with me new ideas about plugin further development and link to your site will appear above. Fix: WordPress multisite: PHP Notice “wpmu_new_blog is deprecated since version 5.1.0! Use wp_insert_site instead.” was removed. URE uses ‘wp_initialize_site’ action now instead of deprecated ‘wpmu_new_blog’. This fix provides correct roles replication from the main blog/site to a new created blog/site. Fix: WP Multisite: Users->Capabilities->Update: “Fatal error: Uncaught Error: Call to undefined method URE_Editor::check_blog_user() in /wp-content/plugins/user-role-editor/includes/classes/editor.php on line 576” was fixed. Fix: WooCommerce group was not shown under “Custom capabilities” section. PHP version 5.5 was marked as required. Update: General code restructure and optimization. Update: URE_Base_Lib::get_blog_ids() returns null, if it’s called under WordPress single site (not multisite). Update: URE_Editor::prepare_capabilities_to_save() : “Invalid argument supplied for foreach()” warning was excluded in case there was no valid data structures initialization. Update: ‘administrator’ role protection was enhanced. URE always does not allow to revoke capability from ‘administrator’ role. That was possible earlier after the ‘administrator’ role update. Update: 2 new actions ‘ure_settings_tools_show’ and ‘ure_settings_tools_exec’ allows to extends the list of sections available at the Settings->User Role Editor->Tools tab. 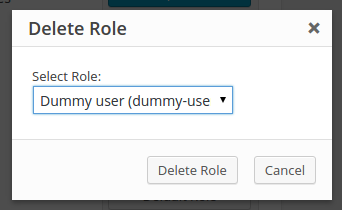 Update: Selected role ID was added to “Delete role” confirmation dialog. Update: Method URE_Base_Lib::get_short_list_str() was enhanced. Update: Method URE_Base_Lib::get_blog_ids() was made public. Update: Method URE_Lib::get_usermeta_table_name() was excluded. Fix: PHP warning “Undefined index:’unexisted role ID'” was fixed at URE_Lib::roles_text() (wp-content/plugins/user-role-editor/includes/classes/lib.php:360). Fix: Bug was fixed with incorrect usage of transient for option “Show deprecated capabilities”. Update: Multisite: Sites list is not requested from the database on every page opened in order to reduce server load. Update: URE plugin version update routine is called now at the wp-admin backend only. Update: Direct access to URE_Lib::bbpress property was excluded as a preparation to future code enhancements. File changelog.txt contains the full list of changes. – Does it work in multi-site environment? Yes, it works with multi-site installation. By default plugin works for every blog from your multi-site network as for locally installed blog without multi-site feature. To update selected role globally for all Network you should turn on the “Apply to All Sites” checkbox. – How to duplicate my custom created roles from main blog of my multi-site network to new created one? “User Role Editor” makes it for you automatically. As new blog added to your network, “User Role Editor” copies full roles staff from your main blog to the new created one. Do not forget about the own User Role Editor’s user capabilities set. 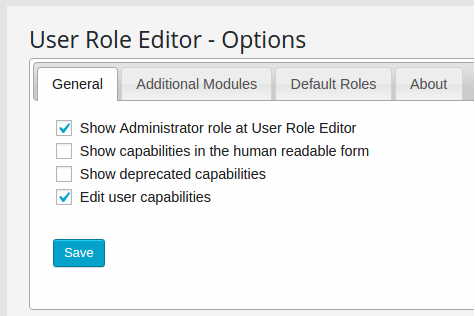 In order local administrator finally get access to the “User Role Editor” you have to add ‘ure_edit_roles’ user capability to the ‘administrator’ role. 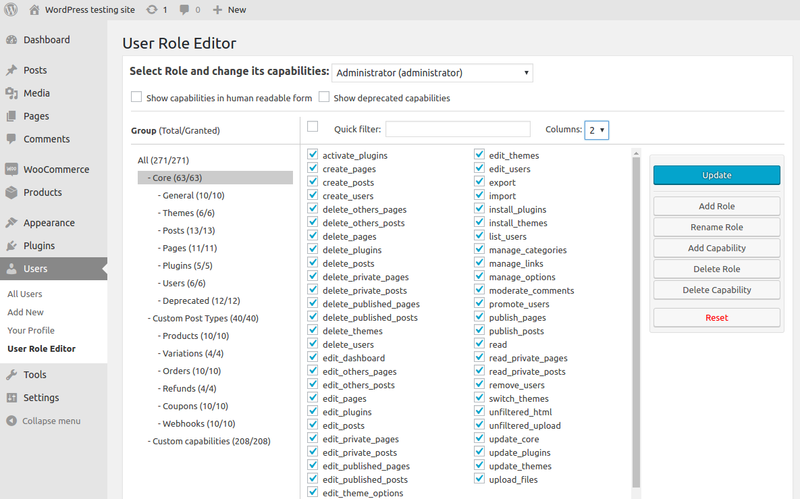 User Role Editor capabilities are added to the ‘administrator’ automatically for the single WordPress installation only. – I have large multi-site network. After click “Update” button with “Save to all sites” checkbox turned on nothing is happened. I got the blank page. It does nothing automatically, just select other algorithm when you press “Update” with “Apply to All Sites” checkbox turned on next time. If you define WP_DEBUG equal to 1 or true constant in wp-config.php file, URE with this directive shows update execution time in milliseconds as additional technical information. – How to edit “Administrator” role? I don’t see it in the roles drop down list. “Administrator” role is hidden from the roles drop down list by default. into your wp-config.php file and login with administrator account for that. If for any reason your “Administrator” role missed some capabilities added by plugins or themes, you can fix that now. But be careful with changing “Administrator” role, do not turn off accidentally some critical capabilities to not block your admin users. – Does it work with WordPress versions prior 3.0? I am ready to answer on your questions about this plugin usage and help with possible problems. 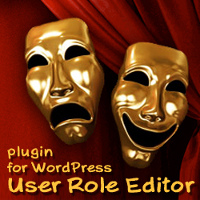 Use User Role Editor plugin forum or this page comments and site contact form for that please. This entry was posted on Saturday, March 20th, 2010 at 10:09	and is filed under Security, ShinePHP WordPress Plugins, WordPress, WordPress Capabilities. You can follow any responses to this entry through the RSS 2.0 feed. You can skip to the end and leave a response. Pinging is currently not allowed.